June 7, 2011 Albuquerque, New Mexico - After filing several 2011 Earthfiles reports about loud and mysterious booms in several states, I have received more emails about unusual and loud booms from California, Texas, Northeast Philadelphia, Indiana and Oklahoma. 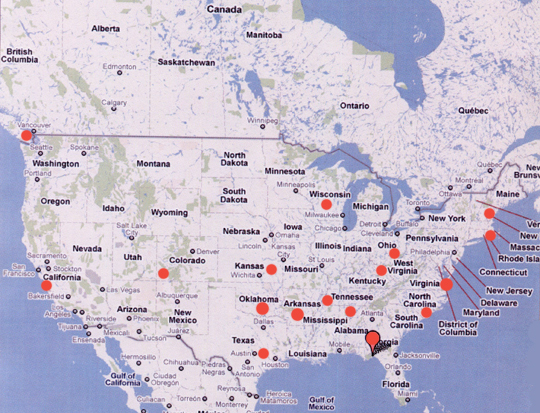 Red dots are locations from White Rock, British Columbia, Canada (upper left circle) to Woodville and Crawfordville, Florida (lower right circle), where residents have heard “loud booms like a cannon” or “rolling, low thunder,” or a “low flying jet,” or “the first half of a lightening strike.” Recent unidentified, mysterious booms have been reported several times since December 2010 into May 2011, and the unexplained boom phenomenon goes back to reports in 1804. My boyfriend lives near the border of Nevada and California. For three years we hear booms underground and we're in the middle of the desert with really nothing around..they happen mostly in the summer and sound and feel like a bomb going off underground. Try to get you longitude and latitude - but he lives off the old Spanish Trail highway about 10-12 miles up from the Hwy 160 turn off. Previous PostPrevious Where is Plutonium-MOX Nuclear Reactor Fuel Ejected from Fukushima Unit 3?